It’s a strange time of year. Things feel like they ought to slow down for the summer, but it doesn’t work quite like that. As students finish their exams and coursework the process of marking then awarding grades takes place, with the important aspect of letting students know how they’ve done. This is obviously especially a concern for final year students as they come to the end of their degrees, and want to see how they’ve done. As staff, while we are marking and entering grades, there is delight in seeing how well students have done and recognising how much they have learned with us. Last week, after months of anticipation, I was informed that I would be awarded a First Class Honours Degree in Psychology! Among the emotions I felt (relief, pride, joy), I was also overwhelmed with gratitude – gratitude for having had the opportunity to undertake study at Cardiff Met. My experience of studying Psychology at this university has always been a positive one. The teaching staff are knowledgeable and passionate, easy to follow during lectures and available to answer questions in person or via email. I found all the staff to be very personable, and I have only positive remarks to make about each lecturer individually. In particular, I could not have wished for a more suited supervisor to help me with my final year project, Dr. Jenny Mercer. Jenny’s knowledge, guidance, and friendliness encouraged my progression throughout, and I shall be eternally thankful to her for this. To become a practicing Psychologist has been my goal since I first pursued started in the university. Though my desired area of practice has changed (mainly due to learning about so many different topics within psychology) my passion for the discipline has only grown, and I am thrilled to be continuing my studies this year as I pursue a Masters in Health Psychology. My decision to stay at Cardiff Met was an easy one. After my experiences here as an undergraduate, I would not even consider study at another institution, and have full confidence that my development and transition into a practicing Health Psychologist will be guided by the lecturers I have grown so fond of. I would without a doubt recommend Cardiff Met to anyone wishing to study Psychology, and am humbled by the opportunity to have been taught by such admirable and accomplished individuals. 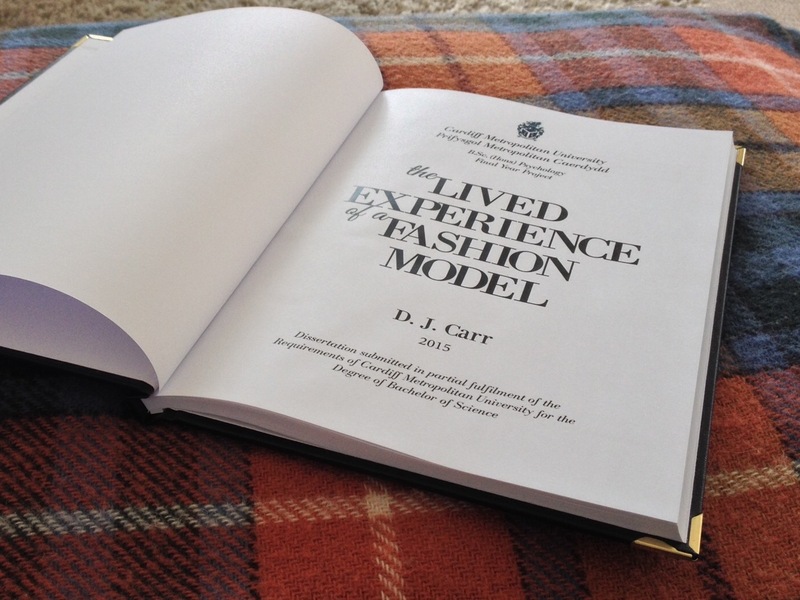 Dan’s project was an Interpretative Phenomenological Analysis (IPA) study entitled ‘The Lived Experience of a Fashion Model’. I have to say that Dan was a delight to supervise because he came to me with a clear idea of what he wanted to look at – the experience of being a model. However, on a practical note he also had links in the industry – which is an important point when selecting a project – you may have grand ideas, but have you though through how you might access potential participants? The other thing (which he does not tell you in this blog) is how hard he worked. He read a lot background literature, some very challenging papers about the principles behind IPA, and was very organised (even getting ethical approval before the beginning of the final year). Also Dan was always prepared to ask me lots of questions, often coming to see me with a long list (don’t be afraid to challenge your supervisor at all times!). Your dissertation is an opportunity to explore in more detail a topic which you select and are interested in; it allows you to demonstrate the research skills that you have acquired during your degree. It is hard work, but it can also be the most rewarding part of your studies. So as you enter the summer vacation start to plan and think of potential ideas….you never know, it could be you writing this blog next year!